Looking for a program to edit your photos? 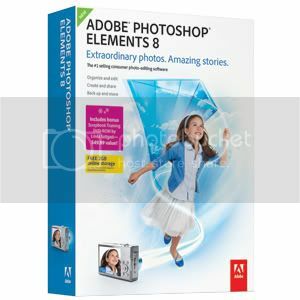 Until November 30, Costco has PhotoShop Elements 8 on sale for $49.99. Use this $20 mail-in-rebate to get the program for only $29.99 (after rebate). Rebate expires October 2010 and cannot be used if PhotoShop is purchased at Best Buy, OfficeMax or Walmart. Costco is a-okay. I’ve never used photo editing software and would love any suggestions from any of you with experience. Do you suggest PhotoShop or another program? "GIMP is the GNU Image Manipulation Program. It is a freely distributed piece of software for such tasks as photo retouching, image composition and image authoring. It works on many operating systems, in many languages. " from http://www.gimp.org. Free is a great price and this software is more than adequate for 95% of what Photoshop will do. So, the "sale" price is actually the price with an automatic manufacturer rebate. Will Adobe do another rebate on top of the costco rebate? Does anyone know how to find out for sure if this works? I'm wondering if any of you might know where to find it for a Mac (Costco only carries the PC version). I have PSE 3 & really haven't taken the time to learn it (I agree, it isn't intuitive at all). I might just get this instead & start with the newest version! For basic photo-editing (turning things black and white, fixing red-eye, cropping, etc) it isn't necessary. However, if you want to get serious about editing your photos or want to jump into digital scrabooking, you want PSE! I'm a digital scrapbooker and designer, and I can say that if you want to go digital, you NEED Photoshop. Some people use other programs, but most tutorials are written for Photoshop Elements (we call is PSE) and Photoshop CS. PSE is MUCH easier to understand than the full version, and this price is amazing! It isn't necessarily the most intuitive software, but there are a lot of great classes and tutorials out there that can help with that.